Xero and QuickBooks Online are even in the features they offer, but your business situation will determine which is right for you. If you need to give a lot of users access to your data, choose Xero because it includes unlimited users. However, if you prefer an accounting software most accountants use, choose QuickBooks Online. If you are looking for an accounting software that you can set up on your own, go with QuickBooks Online. QuickBooks has an ecosystem of 50,000 certified ProAdvisors in the U.S., which means you won’t have any problems finding a local expert to help you get set up. In addition, all QuickBooks plans include live telephone and chat support. For a limited time only, receive 50% off QuickBooks Online. If you’re looking for an affordable way to process payroll for less than 10 employees, or you prefer an accounting software that doesn’t charge you to add additional users, choose Xero over QuickBooks Online. Unfortunately, with only 400 certified advisors in the U.S., finding an accountant who knows Xero might be a challenge. Quiz: Is Xero or Quickbooks Best For You? Do you need to give 8 + users access to your data? Can you afford to hire a Certified Advisor if you need one? There are some basic features that should be included in any accounting software, including the ability to create invoices, manage bills, and give other users access to your data. We compared those features, along with cost, ease of use and setup, and customer support. After taking both QuickBooks Online and Xero for a test drive and evaluating their ability to meet the above criteria, we chose QuickBooks Online over Xero. While Xero did meet all of the criteria listed above, it fell short in one key area: no live customer support options. Most small business owners don’t have the budget to hire someone to set up their books, so they do it themselves. As a result, we felt that having a live person to call or chat with was a critical component to success. Live customer support is included with all QuickBooks Online support plans, so they are our top pick. When it comes to pricing and features, you couldn’t find two more similar products than QuickBooks Online and Xero. Xero has got QuickBooks beat when it comes to number of users and payroll processing. However, QuickBooks Online has got Xero beat when it comes to customer service and its large ecosystem, which makes it easy to find a bookkeeper/accountant who is familiar with QuickBooks. QuickBooks Online has three pricing plans that run between $20 and $60 per month. When it comes to features, all three plans can manage accounts receivable and you can connect all of your bank and credit card accounts so your data downloads into QuickBooks. Check out our QuickBooks Online comparison guide to learn more about the benefits these plans have to offer. QuickBooks Online Simple Start is ideal for a startup business that primarily pays all of their bills online through their financial institution or via credit card. However, if you need to keep track of bills prior to payment, then you will need to go with the QuickBooks Online Essentials plan. QuickBooks Online Essentials is ideal for small and large service-based businesses that have heavy accounts payable and accounts receivable; it is also ideal if you need to keep track of hours worked by project/job. QuickBooks Online Plus is ideal for a product-based business that needs the ability to create purchase orders, record inventory receipts, and track product sales. In addition, if you have 1099 employees, this is the only QuickBooks Online plan that allows you to do 1099 reporting. QuickBooks Online Self-Employed is not included in the above table, but it is another online QuickBooks product. It is ideal for freelancers like web designers and bookkeepers who want simple software that will help them to track income and expenses and calculate their quarterly tax payments. Similar to Xero, QuickBooks Online has a robust accounts receivable module that allows you to create custom invoices, email invoices to your customers, and accept online payments. You can also run a detailed accounts receivable aging report to stay on top of unpaid invoices. You can manage your bills in two out of the three QuickBooks Online plans: QuickBooks Online Essentials and QuickBooks Online Plus. However, Xero includes accounts payable features in all three of their plans. Track and pay bills via check or online, and stay on top of what you owe suppliers by generating a detailed accounts payable aging report. Both QuickBooks Essentials and QuickBooks Plus allow you to give multiple users access to your data. QuickBooks Online Essentials allows you to give up to five users access, and QuickBooks Online Plus allows you to give up to seven users access. However, Xero has got QuickBooks beat in this area because all three of their plans allow you to give unlimited users access to your data! Both QuickBooks Online and Xero allow you to connect all of your bank and credit card accounts so that all of your transactions automatically download into the software. Connecting your bank account to QuickBooks Online takes just a few minutes. Check out our How to Import Banking Transactions video tutorial to see how this works. Both QuickBooks Online and Xero allow you to keep track of the products that you sell. 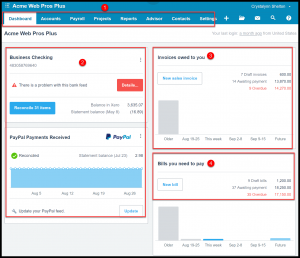 However, this feature is only available in QuickBooks Online Plus, Xero Growing, and Xero Premium editions. Inventory tracking is not available in the starter plans. The inventory tracking feature includes creating purchase orders, updating all quantities and costs when purchasing goods, and tracking cost of goods sold when sales are made. Similar to the inventory tracking feature, multicurrency is only available in QuickBooks Online Plus and Xero Premium 10 plans. This feature allows you to invoice customers and pay suppliers in their native currency, and all of the exchange rate calculations are done for you! You get access to 1099 reporting in the QuickBooks Online Plus, Xero Growing, and Xero Premium plans. This feature allows you to track payments made to contractors so that you can meet 1099 reporting requirements. You have the option of sending 1099 forms via email or snail mail. Unlike QuickBooks Online, Xero does not include budgeting and forecasting in any of their pricing plans. With QuickBooks Online, this feature is only available in the top tier plan, QuickBooks Online Plus. This feature allows you to create income and expense budgets as well as create budgets for a specific job or customer. Both QuickBooks Online and Xero have payroll processing options that integrate seamlessly. To turn on payroll in QuickBooks Online, you must pay an additional fee of $39 per month plus $2 per employee versus $39 per month plus $6 per employee to add payroll to Xero. Xero has three pricing plans that run between $9 and $60 per month. While the Starter plan, which runs at $9 per month, is limited, all three plans include unlimited users, accounts receivable and accounts payable tracking, and key financial statements such as the profit and loss statement, balance sheet report, and statement of cash flows. Unfortunately, the Starter plan is just too limited for us to recommend to even a startup business; with the limitations you have with tracking income and expenses, you will quickly outgrow this plan. Instead, we recommend that you choose the Xero Growing plan. The Xero Growing plan is ideal for a service-based or product-based business that has employees and 1099 contractors that they need to pay. The Xero Premium 10 plan is ideal for a business that is planning to do business on a global level. If you have customers in foreign countries or suppliers abroad, you can create invoices in any currency and pay your suppliers in their native currency. Xero includes the ability to manage full-cycle accounts receivable in all three of their pricing plans. Like QuickBooks Online, this includes creating invoices, recording payments, and generating a detailed accounts receivable aging report to keep an eye on open customer invoices. Unlike QuickBooks Online, which does not include accounts payable in their Simple Start plan, Xero includes the ability to manage bills in all three of their pricing plans. However, these features are limited in the Xero Starter plan. You can track bills and payments, and run a detailed accounts payable aging report to ensure you pay your suppliers on time. You can give as many users as you need access to your Xero account, and you won’t have to pay any additional fees to do so! Unlike QuickBooks Online, Xero allows you to give an unlimited number of users access to your data for free. This is available for all three Xero pricing plans. If you prefer to pay your bills online and you don’t write checks, you can connect all of your bank and credit card accounts to Xero. Like QuickBooks Online, connecting your accounts is very easy to do. Check out our Setting Up Bank Feeds tutorial to see for yourself! Similar to QuickBooks Online, you can set up and track all of your products in Xero. This includes creating purchase orders, automatic updates to inventory for purchases and sales, and keeping track of inventory costs. For step-by-step instructions, check out our How to Set Up Products and Services video tutorial. Xero is able to keep track of transactions in a foreign currency. You can create customer invoices, pay vendor suppliers, and manage bank accounts in multiple currencies. Like QuickBooks Online, Xero will do all of the calculations for you. Check out our video tutorial on How to Set Up Multicurrency in Xero to learn more. If you need to do 1099 reporting, you will have to sign up for the Xero Premium 10 plan. It is the only Xero plan that includes this feature. Similar to QuickBooks Online Plus, you can track all payments to 1099 contractors and generate the required tax filings at the end of the year. Unfortunately, none of the Xero plans include the ability to do budgeting and forecasting. If this is a feature that you need, we recommend you go with QuickBooks Online Plus. QuickBooks Online and Xero are both very user friendly. I’ve been able to do several company file setups using both programs and in my opinion, QuickBooks is easier for someone who has no accounting/bookkeeping background. On the other hand, I felt like I needed my accounting knowledge to understand certain areas in Xero, like the chart of accounts. However, when I couldn’t figure something out, I used the support tools within Xero, which are very good. Similar to Xero, QuickBooks Online is easy to navigate. 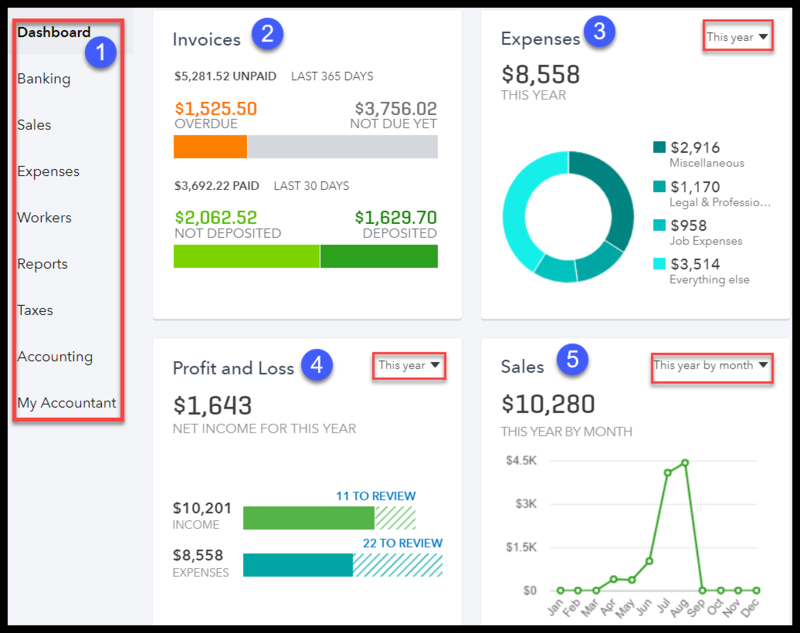 It has a colorful homepage with a dashboard to give you a snapshot into every aspect of your business: invoices, expenses, profit and loss, and sales. The QuickBooks Online menu bar is on the left side of the screen, whereas in Xero it is located at the top of the screen. Left Menu Bar: To navigate the program, just make your selections from the menu located on the left side of the screen. Invoices: This section provides you with a snapshot of invoices that are overdue, not due yet, payments received that have been deposited, and payments that have not been deposited yet. Expenses: In this section, you will find a snapshot of the total expenses along with a breakdown of the categories for the top three for your business. In the above example, the top three expenses are Miscellaneous, Legal & Professional, and Job Expenses. Profit and Loss: Keep tabs on your profit/loss status by reviewing this section. You can choose the time period you would like to see by clicking on the drop-down arrow in the upper right corner. Sales: Stay on top of sales by reviewing this section, which shows the total amount for the year ($10,280) as well as a graph that shows sales by month. You can choose the time period from the drop-down in the upper right-hand corner. Menu tabs: Easily navigate to other areas of the program by clicking the menu tabs, as indicated above. Bank accounts: In this section, you will see a snapshot of all bank accounts you have connected to Xero, including checking, savings, and PayPal accounts. Invoices owed to you: In this section, you will see a summary of all open customer invoices (accounts receivable) divided into three groups: draft, awaiting payment, and overdue. Bills you need to pay: This section includes a summary of the status of your bills, which are categorized into three groups: draft, awaiting payment, and overdue bills. When it comes to customer service, QuickBooks Online beats Xero hands down. Unlike Xero, QuickBooks Online offers live customer support via telephone or chat in all of their pricing plans at no additional charge. Unfortunately, the only way to contact the Xero support team is to send an email. The good news is that they work 24/7, so hopefully the response will be less than 24 hours. As discussed, QuickBooks Online offers live customer support. In addition, there are several other resources, such as detailed support articles and video tutorials, that you can access to get up to speed with QuickBooks. Fit Small Business QuickBooks Course – This free course was designed to help small businesses like you get up and running quickly. It includes video tutorials as well as written instructions on how to set up QuickBooks. Chat – You can chat with a support agent by logging into your account and clicking on the Help option. Phone – Customer service reps are available Monday through Friday, 6 a.m. to 6 p.m. PST and Saturdays, 6 a.m. to 3 p.m. PST. Email – If you can’t find the answer to your question, you can submit a detailed question to the support team via email; you can generally expect a response within 48 hours. QuickBooks Online Learn and Support – If you don’t mind doing a little research, you can check out the Learn and Support page. Use keywords on this page to locate the answers to your questions. The articles you will find provide step-by-step instructions. As mentioned, Xero does not have the option to speak to a real, live person. However, they do have some great self-help options that I have found very useful: the Xero Business Help Center and Xero University. Fit Small Business Xero Course – A free course that includes 30 video tutorials that cover how to set up your business in Xero, how to record sales, pay bills, and run financial reports. Xero U (University) – Xero University includes video tutorial courses that you can take to learn how to use Xero. The topics are broken down into three user types (accountants, bookkeepers, and small business owners). One of the benefits of using cloud accounting software is that it has an open platform which allows other apps and software products to seamlessly integrate with it. Both Xero and QuickBooks integrate with financial institutions so that your bank and credit card transactions can automatically download daily to your accounting software. In addition, Xero and QuickBooks integrate with hundreds of apps that you may already be using. QuickBooks Online integrates with more than 600 apps. Insightly CRM, Shopify, Stripe, and Gusto are just a few of the apps you will find in the QuickBooks Apps store. Unlike Xero, QuickBooks has its own credit card processing service that integrates seamlessly in QuickBooks Online — QuickBooks Payments. In addition, Intuit Online Payroll can be added to any QuickBooks Online plan for an additional cost. It also integrates seamlessly with your QuickBooks Online software so that everything is under one roof. Xero integrates with over 700 apps. Fishbowl for inventory, Insightly CRM, and Squarespace are just a few of the apps you will find in the Xero Apps Marketplace. 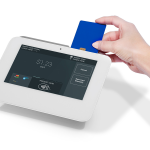 While Xero doesn’t have its own credit card processing and payroll service, you can sign up for Gusto, which handles all aspects of payroll and integrates with Xero. 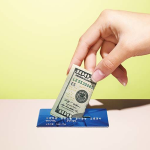 For credit card processing, you can choose from over 30 products like Stripe, PayPal, and Square. Both QuickBooks and Xero recognize the need to provide lending solutions to their small business customers. In an effort to meet that need, QuickBooks has its very own lending product called QuickBooks Capital, and Xero partners with BlueVine, Kabbage, and Fundbox to help provide loans and lines of credit to small business owners. QuickBooks Capital is Intuit’s lending product that was launched in November 2017. With QuickBooks Capital, small businesses can access loans up to $100,000 with up to 12-month terms. In order to apply for a loan through QuickBooks Capital, you must receive an invitation. Customers who have been pre-qualified will receive a notification in their QuickBooks file and can follow the on-screen instructions to apply. In general, a decision will be made within two to three business days, and most loans will fund in two business days. What makes QuickBooks Capital unique is the ability to evaluate the performance of a small business with the help of QuickBooks data. Intuit uses the insights into your open invoices, cash flow forecasts, sales trends, and profitability to offer the right loan for your small business. Currently, QuickBooks Capital has funded $200 million in cumulative loans to small businesses! If you don’t receive an invitation to apply for a loan through QuickBooks Capital, QuickBooks partners with BlueVine, Kabbage, and Fundbox to provide small businesses with ideal terms and rates on business loans and lines of credit. You can easily connect your QuickBooks Online account to one of these partners; they will review your QuickBooks data and evaluate your creditworthiness without you needing to submit a single piece of paper. While Xero doesn’t have a lending product like QuickBooks does, they partner with companies that specialize in providing loans and lines of credit to small business owners like yourself. BlueVine, Kabbage, and Fundbox partner with Xero to provide their small business customers with the best terms and rates on business loans and lines of credit. You can connect your Xero account to one of these partners and they will review your data without you having to submit any loan documents! Both QuickBooks Online review and Xero reviews are mixed. Many of the reviews highlight some of the great features like payroll processing in Xero plans and the live customer support available in all QuickBooks plans. On the flip side, customers feel that QuickBooks Online is a bit pricey, and Xero customers wish there was an option to speak with a live customer support person. QuickBooks Online reviews indicate that customers like how user-friendly QuickBooks is and how easy it is to access their data using the mobile app. A few customers feel that QuickBooks is expensive, but they feel that the amount of features and the unlimited customer support makes it worth it. You can read all of our reviews on the QuickBooks Online reviews page. Xero users like how easy the program is to navigate. In addition, the inclusion of payroll processing for up to ten employees at no additional charge is also another feature that’s popular with Xero users. On the negative end, users feel that Xero should offer live customer support as opposed to email support. 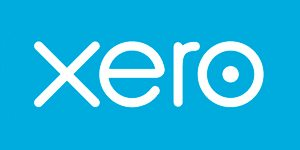 Check out our Xero Online reviews page to read all of the reviews. If you’re still not convinced that QuickBooks Online or Xero will work for you, we’ve got a few other alternative providers that may fit your needs. QuickBooks Desktop Premier is ideal if you are a nonprofit, contractor, wholesale and distribution, professional, or retail business. If you want a software that will improve your billing and payment process, FreshBooks will help you do that. Finally, if you just don’t have the budget for an accounting software, give Wave a try — it’s free. If you’re looking for a software that is customized for your industry, check out QuickBooks Desktop Premier. QuickBooks Desktop Premier is ideal for small to mid-sized businesses in the nonprofit, manufacturing and wholesale, professional, contractor, and retail industries. Unlike Xero and QuickBooks Online, this software includes a chart of accounts and reports that are customized for the above industries. Pricing starts at $499.95 for one license; this is a one-time fee and includes free tech support for the first 30 days. If you are a freelancer or solopreneur who needs to invoice customers for hours worked, FreshBooks will work for you. You can create custom invoices, invite team members to access FreshBooks so they can keep track of hours worked for each project, and easily transfer hours to an invoice to send to your customer. FreshBooks offers three pricing plans starting at $15 per month. If you just don’t have the budget to purchase an accounting software but you need a better way to track your income and expenses, try Wave. Wave is a free accounting software that you can use to track accounts receivable, accounts payable, connect your bank and credit card accounts, and run detailed financial reports. Head over to their website and sign up for your free account. Now that you know more about Xero and QuickBooks, the decision should be easy. If you have tried QuickBooks in the past and you’re looking for a close alternative to QuickBooks, go with Xero. However, if you are looking for an accounting software that will provide you with the support that you need, go with QuickBooks Online. If you want to know how Xero and QuickBooks stack up against other products, check out our accounting software guide. It takes just a few minutes to get started with QuickBooks Online. Just head over to their website and provide a few contact details about your business, such as your business name, business phone number, and email address. You will be able to start entering your data to track your business finances immediately. Save up to 50% off for a limited time.